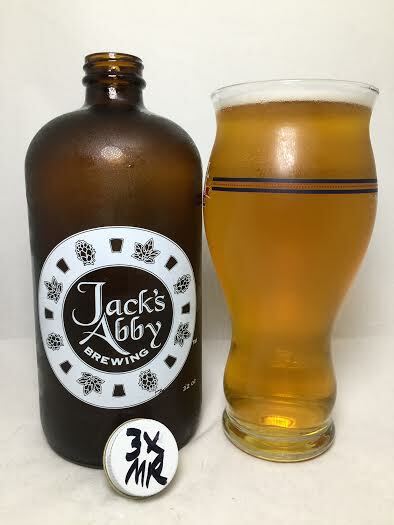 Recently I made my first trip to the new Jack's Abby Beer Hall and it was a success on all fronts. A huge, open area for eating, drinking, mingling, etc, a good food menu with homemade pizzas, and 24 beers on tap (with brewery-only exclusives) made for a feast for the senses. Naturally, I had to take a little something home and what better beer to have to myself than a draft special. The standard Mass Rising is a big Double IPL, but this edition is triple (yes, TRIPLE) dry-hopped and contains Equinox and Mosaic. Yay! Pours a transparent dark yellow bordering on light orange. As aggressively as I poured I still only got less than a half finger of brilliant white head. Lager yeats is noticeable on the aroma and is obscured by a strong resin character and wet grass. Then there's some tea leaves, sawdust, and cedar. Garlic and onion come out swinging and they almost one-punched me like McGregor on Aldo, but if you stick with it, you will see other flavors are to be had. This has a significant spicy hop quality to it along with a dank, weed-like contribution that is (quite literally) like fresh grass. I can't get over the big resin presence as well as somewhat of a bready quality. The further it travels through the mouth, the more the aforementioned garlic and onion keep fighting their way to the front. If I concentrate hard I can get just the faintest hint of pine or sap, but nothing overwhelming. Overall it is a dank-tasting beer with spices. Mouthfeel is surprisingly thick and syrupy. Granted it is a big 8.0% IPL, but it actually feels bigger and could even be classified as a "Triple IPL". With this version, the drinkability isn't exactly sky-high, but it is still not a challenge to put away. No alcohol presence or warming either. This 3x dry-hopped version of Mass Rising brought an interesting blend of flavors to the table with garlic/onion and spices dominating. Luckily some fresh grass and dankness made things a bit easier, but I think some more help from the Mosaic hops would have made this an easier-drinking experience. You'll need to go elsewhere for something a bit tame, but if you want a big, thick, ballsy Imperial IPL, then this is your jam.